Goaltenders who do our goalie only school are eligible to do any summer day school at a cost of only $175.00. 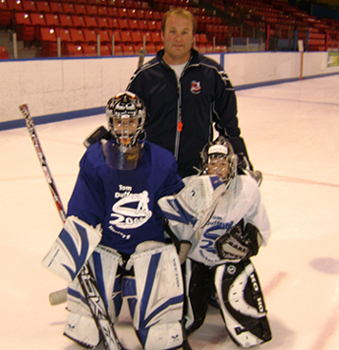 July 22 – July 26 we offer a comprehensive Goaltenders only school in Halifax Civic Arena. In addition, for all our other 2019 schools (except Spring) we accept Goaltenders (3 in each group) who receive a discounted fee. At each of these schools we assign a goalie coach who deals only with the Goaltenders. With our emphasis on game situation drills, these schools are excellent in addition to the regular Goaltenders school. Goaltending isn’t just a position on the ice, but a passion for those who play it. If you love goaltending then the Tom Duffey Goaltending School is your only destination where you can fuel your passion for goaltending! The Tom Duffey Goaltending School is your complete source for everything goaltending! We have outstanding personalized and professional instructing, and once you have attended the Tom Duffey Goaltending School and experienced this for yourself, it is the place you will return to again, and again! For the beginner and intermediate goalies, we want to instil a firm foundation of the fundamental skills required to excel at this unique position. For the advanced goalie, we want to provide direction for understanding the more intricate details of goaltending and knowledge of the intangible skills necessary to be an effective goalie. We also want to assist goalies who are capable of playing at higher levels of hockey (prep school, junior, college and even professional) attain those high aspirations through coaching and guidance. With us, goaltending is not just a position, but it is a PASSION! At the Tom Duffey Goaltending School, we teach everything about both the art and the science of goaltending. We believe that goalies should be taught to master ALL skills necessary to play the position. The more skills you have, the better you will be and throughout your playing career, different coaches will want you to do different things, so you must be able to adapt and to do it all! We teach the goalies to "play the situation", rather than simply playing the puck, and that at the appropriate moment in a game a goalie must use every fundamental save technique within their tool kit. Therefore, although techniques such as the two-pad stack are not used nearly as often as the butterfly, ALL goalies (NHL included) still use these skills when the right times arises. Therefore, we teach all fundamental skills, along with excellent butterfly technique, and we are the best at teaching goalies the right time to use these saves! The Tom Duffey Goaltending Schools coaches will only try to correct what needs to be corrected. Far too many coaches attempt to repair what is not broken. Our staff analyzes the goalie for weaknesses and then focuses on correcting areas of the goalie's game where we see trends in goals or lower percentage save selections. We do not try to make every goalie use the same style or try to change areas of the goalie's game that are already strong. We are also extremely concerned with the quality of the drills we perform on the ice and in ensuring that the goalie practices each drill in a fundamentally correct fashion. We truly believe that “practice alone doesn’t make perfect, but perfect practice makes perfect. The number of repetitions of a drill are of little significance if the drill is not properly completed. To that end, we strongly believe in a lower number of repetitions performed with technical perfection and with the greatest intensity. Again, we believe in providing goalies with instruction surrounding all the basics of goaltending: butterfly saves, two-pad slides, glove and blocker saves, stick handling, recovery skills, rebound control and everything else you can think of. We believe that there is a time and place for every fundamental move in the goalies repertoire, so we feel it is our obligation to teach all saves. We also teach the different situations under which a goalie will make every type of save.